Established in 1997, e-travel is secure and recognized as one of Ireland’s leading independent travel agents. e-travel is bonded with ITAA and Commission of Aviation. Here at e-travel, we believe that booking a holiday shouldn't be stressful. e-travel specializes in cheap flights as well as cruises to the Mediterranean, Caribbean, Canary Islands, Alaska, Australia & New Zealand, South America & Duba as well as cheapest hotels, flights and cruise and stay packages worldwide. 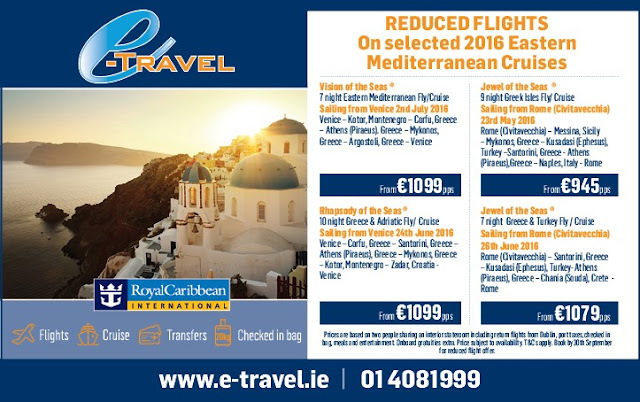 Reduced flights on Eastern Mediterranean Cruises from Rome and Venice. Celebrity Cruises have been awarded Cruise Line of the Year by Food & Travel Magazine! Celebrity Cruises are delighted to announce that for the second year in a row, Food & Travel Magazine readers have voted to award then Cruise Line of the Year! 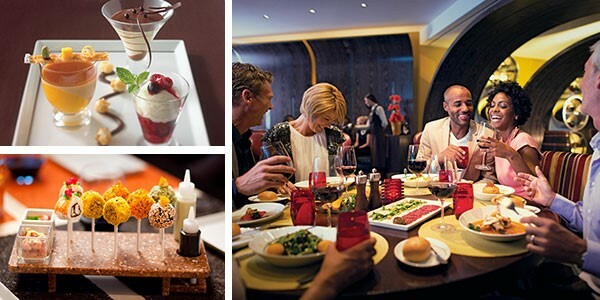 With up to 12 restaurants on each ship serving globally inspired cuisine, Celebrity Cruises truly offers a Modern Luxury experience for its guests! Miami – September 10, 2015 – When Norwegian Escape makes her maiden voyage in November, the ship will feature unprecedented dining, beverage and entertainment options-- and now, luxurious shopping with two dazzling name-brand boutiques. The two boutiques – LACOSTE and Carolina Herrera – will be the first at sea for each acclaimed brand, as well as the first boutiques to be designed specifically for a Norwegian Cruise Line ship. These new offerings are the latest of several that are shaping Norwegian Escape into one of the most sensational cruise ships at sea, with other alliances including Jimmy Buffet’s Margaritaville; James Beard Award-winning Iron Chef Jose Garces; Michael Mondavi Family Wines; Tony Award-winning Broadway musicals After Midnight and Million Dollar Quartet; and more. More than 80 years after its founding, LACOSTE continues to be a sport inspired lifestyle brand renowned for elegance and comfort. Famous for its iconic polo shirt, LACOSTE offers sportswear apparel for men and women, as well as footwear, eyewear, watches, fragrances, leather goods, and other items. The LACOSTE boutique aboard Norwegian Escape will include a wide assortment of clothing items, including signature polos, t-shirts, dresses, skirts, footwear, and accessories. Carolina Herrera is an international fashion house recognized for timeless elegance and refinement. From fashion and accessories to fragrances, the brand embodies the creative vision established by founder, Carolina Herrera, over three decades ago. The Carolina Herrera boutique aboard Norwegian Escape will include beautiful, hand-selected luxury products, including handbags, leather goods, pashminas, scarves, jewelry, footwear and accessories. In addition to dedicated boutiques, Norwegian Escape will feature further retail from widely-recognized brands including, but not limited to, Hublot, Bvlgari, Tissot and Uno de 50. The ship will be the first to introduce Ulysse Nardin watches, as well as a hand-picked collection of Columbian Emeralds, also exclusive to Norwegian Escape. Norwegian Escape, soon to be the largest ship in the Norwegian Cruise Line fleet, will sail weekly seven-day cruises from her year-round homeport of Miami to the Eastern Caribbean beginning on November 14, 2015. The 164,600 gross ton ship will be the largest ever to home port year-round in Miami, carrying 4,200 guests to tropical Caribbean destinations including St. Thomas, U.S. Virgin Islands; Tortola, British Virgin Islands and Nassau, Bahamas. 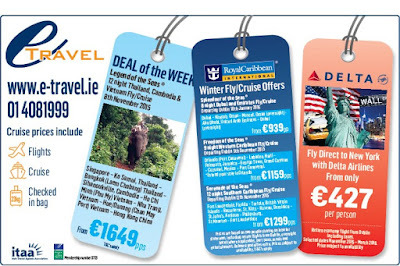 Contact e-travel on 01 4081999 for more details and pricing. Royal Caribbean Asia, Dubai and Caribbean cruise deals! Pilots at German airline Lufthansa started a second day of strikes on Wednesday, grounding around 1,000 flights and affecting 140,000 passengers, and said more strikes would come if management did not improve their offer in a row over cost cutting. Lufthansa had tried to stop the strike, the 13th in 18 months, with a temporary injunction but on Tuesday night two courts ruled in favour of the pilots' union, Vereinigung Cockpit. "If there's no new offer from Lufthansa we will call for a further strike," VC spokesman Markus Wahl told Reuters at Frankfurt airport. He said strikes could occur at any time, though the union would give 24 hours' notice. AIRPORT workers have voted to strike in a dispute over pay. Up to 30 GMB union members who operate the security scanners at Stansted Airport will walk out at the weekend. They want a 3 per cent pay rise and have rejected the company’s 1.5 per cent offer. Full Time positions. Monday – Friday working week. As part of the growth of the eTravel Leisure Travel Department, we are looking for an experienced Leisure Reservations Consultants to join our team. Successful candidates will join one of Ireland’s most respected teams of travel professionals and benefit from a fantastic and sales friendly work environment with ongoing training and development. • Minimum 3 years’ experience as a Reservations Agent. It is essential to have reservations experience. • Minimum 3 years GDS experience, preferably Amadeus. • An ability to work in a busy and demanding environment as part of a busy sales team. • A positive customer friendly approach with a great telephone manner. • Strong literacy and numeracy skills. We will also consider applicants with ticketing experience in place of leisure sales experience and who wish to move to a role combining ticketing and leisure reservations. • Product and software training. • Opportunity in a growing business. • Monday to Friday office hours. 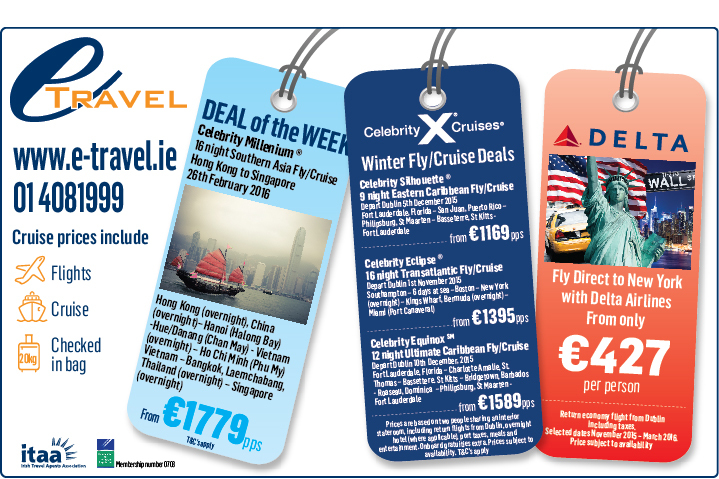 Celebrity Cruise Deals and Cheap flight to New York! 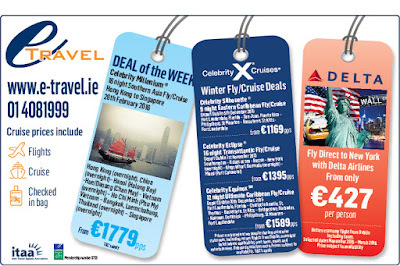 Celebrity Cruise Winter Cruise Deals! and fly to New York with Delta from €427 pp.